Pigeons used to enjoy and sit at the places where they get some food and water for them. You must remove the water and the food resources like the cans filled with garbage and other material. If you are not at your home, but you want to get your garden clean from the pigeons then you may use the rotating sprinklers to get rid of these. Getting rid of the pigeons by destroying their nests and eggs seems insane and make your cruel, but it is the way by which you can get rid of the pigeons without getting any external help. According to the experts, if you destroy the nests just before 2 weeks of hatching, then it will help them to take their eggs somewhere else. Using the pigeon repellent can also be useful for the people to get rid of the pigeons. These products are easier to get as you can get these from the local markets around you. You don’t need to pay too much to get these products. The Pigeon repellent is applied on the roots of the bushes and it keeps them away from all. Nowadays, people are using the live traps where the pigeons got stuck. It is the trap made up of net. This trap is spread on the floor and some food is added on it. Pigeons come here to get some food and got trapped. 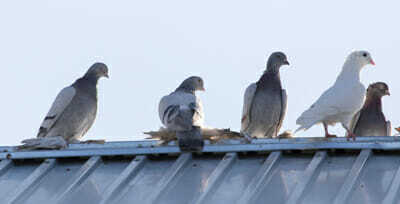 The professionals use different ways especially the medical ways to remove the pigeons from the environment. These professionals are not readily available, but you have to take appointment to get your work done. Ranger Pest Control is also one of the professionals that help the people to solve their issues like pigeons and the insects from their homes.